Location: Panagyurishte is situated in a small valley of Central Sredna Gora Mountain Range along the banks of Luda Yana River. It is 43 km north of the district town of Pazardzhik and 91 km south of the capital Sofia. History: The region was settled since prehistoric time. A Thracian town existed on the site during 4th century BC. 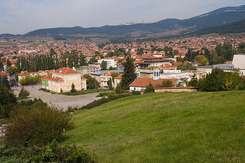 Later on, during the time of the First and the Second Bulgarian Kingdom the settlement was known as Kamenograd (Lithopolis) – The Stone Town. First the settlement was mentioned as Panagyurishte in a register of 1579. The name derives from the Greek word “panagir”, which means “fair”. During the Turkish slavery it was a privileged village for accommodating soldiers. It had a special status, according to which no Ottoman Turk was entitled to settle or even to overnight in Panagyurishte. But Panagyurishte left in history during the time of April Uprising in 1876. 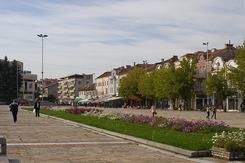 The town was active centre of the national liberation movement. The first National Assembly took place in Oborishte site near Panagyurishte. Here the flag of uprising was waved. It was sewn by the local teacher Raina Knyaginya. The flag had the words “Freedom or Death” embroidered on it and it is one of the Bulgarian national symbols. 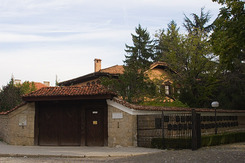 April Uprising was routed and hundred of the citizens of the town were slaughtered but their act of heroism contributed a lot to the liberation of Bulgaria. In 1949 Panagyurishte Gold Treasure was found 2 km south of the town. The unique find dates back from the 3th – 4th century BC and it was exposed all over the world. 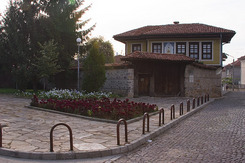 Landmarks: There are many restored houses from the revival period in Panagyurishte. Doudekovs house host the Ethnographic Museum, which illustrates the life and customs in the town at the end of 19th century. The Museum of history is dedicated to the Revival period and April Uprising. 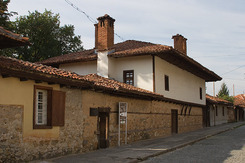 The house museums of Raina Knyaginya, Touteva House, Lekova house, the native house of the famous Bulgarian historian and the first minister of Education in newly liberated Bulgaria, Marin Drinov, “St. George” church and the temple of the "Holly Virgin” are also remarkable places of interest. An impressive memorial complex was erected above the centre of Panagyurishte in honour of April Uprisng. Vicinities: The historical site Oborishte is 10 km north of the town amid a venerable beech forest. Panagyurski Kolonii Recreation centre is situated on the highest point along the road to Zlatitsa. There are many villas and camps.